How to start an export import firm in India? I hope, this article about setting up an Export Import business in India helps the traders to enlighten necessary procedures and formalities to start an International business in India. Government of India amends formalities and procedures to set up an Export / Import firm time to time. So, I write this article about setting up an Import / Export Firm, to let you know an apparent idea about subject. Those who need to start an export import organization can visit necessary departments to have a clear idea on this subject – How to set up an Export Import firm in India. Once after forming a firm name, you need to have a rental agreement with the premise owner. This rental agreement may be required for various government authorities to register your address proof of firm. While drafting rental agreement, please make sure, you have paid necessary legal charges as stamp duty on your document. You need to make sure all details furnished in the document are in order including the authorization and witnesses. If the premise is your own and your firm is a proprietorship concern, you need not arrange any separate rental agreement, the sale agreement deed of said premise is treated as a proof of address. However, if the premise is your own and your firm is a partnership firm involved by other partners, you need enter in to a rental agreement with other partners. PAN is an income tax ID number issued by Income Tax Department. PAN means Permanent Account Number. You need to provide your required information with supporting documents with Income Tax Authorities if necessary. Most of the business transactions are now linked with this 10 digit - alpha numerical - PAN number by government. Separate permanent account number for individual and firm is required to be registered with income tax department. Is individual PAN number sufficient for firm name? This is a common question among business men who just entered in to the business. Whether a business man has to obtain a Permanent Account Number – PAN in his firm name, although he has already obtained PAN in his individual name from Income Tax Department. Here, if you are a sole proprietor of your firm, your individual PAN number is sufficient, as there is/are no other partners on your firm. However, if the firm is a partnership a separate permanent account number – PAN in the name of firm is required to be obtained from Income Tax Department. While applying for the said common PAN number in the name of company, a copy of individual PAN number of each partner has to be mentioned in the application form. If your firm is a private limited company or public limited company, you need to obtain a separate PAN number in the name of your firm other than your individual PAN number. While applying for the said common PAN number in the name of firm, a copy of individual PAN number of each director, has to be mentioned in the application form. Click here to continue reading How to set up an export import firm in India – Part 2. In this article I have explained about the procedures and formalities to set up an export import company in India. Do you wish to add more information to update this article about setting up an import export firm in India? Share below your thoughts about starting an export import company in India. Comment below your thoughts about this subject – How to set up an export import firm in India? Who has to pay GST? swati chaudhary: On 19 October 2013 Kindly please provide me the complete and brief details for taxes and duties. Nithin: On 03 February 2014 Dear sir/mam.I like to start import/export business.can i get the complete details about this business. The main problem is that at the begning we are not seeing the buyer physically.so how can we believe that he or she might import the product to us? ?How will we come to know?? Surendran Kollerath: On 08 March 2014 Hi Chhabra, Suggest you to consult a good consultant. You can succeed. Muthukumar: On 31 March 2014 I am going to start a proprietorship firm in my home for exporting of agricultural commodities ( As merchant Exporter ) for that , where i have to register my firm ? . The bank officials are saying that after the registration of your company only you can get a current account in the name of your firm . So i hope you will guide me . Jatin Desai: On 31 March 2014 Thanks... for this vital detail. Please also put total information about how many types of licences one has to require to do export business and take different types of benefits and duty drawbacks,and process to get those licences. Ntiba Emmanuel: On 08 April 2014 It's a fantastic ideas and I love it. its nice. I want to start. how do I get it done, please, help. P Bharadwaj: On 22 May 2014 Hello everyone, I need your help and suggestion. I want to start an export firm in India along with a friend of mine, to export Tea and Vegetables to Qatar and Dubai. Can you please tell me what are the steps involved in opening up the Company in India. Can I open the company from any state in India? I am currently in Bangalore and would like to open it from some other state, since I am not familiar with Bangalore. Any suggestions or advice will be highly appreciated! Please share some contact numbers or links that I can access. nitin: On 25 June 2014 Thanks for such useful information. i want to export fresh fruits. i want information in more details. please tell me about currency exchange, shipment. sainath kondekar: On 17 July 2014 if to start export from home; is it necessary to have a name of business? if yes where to register the name of business? or do one need to open a firm,achieve licence for firm,register name of the business? all these stuff is needed? is there any provision to start import export business right from home? Admin: On 17 July 2014 Hi Sainath kondekar, You can start business from at the premises where you stay. However, the work place is treated as commercial where ever applicable. Regular export licence procedures need to be followed. Details of procedures depends up on your nature of export business. GAYATRII SHARMA: On 15 September 2014 if to start export from home; is it necessary to have a name of business? if yes where to register the name of business? or do one need to open a firm,achieve licence for firm,register name of the business? all these stuff is needed? is there any provision to start import export business right from home?. for this vital detail. Please also put total information about how many types of licences one has to require to do export business and take different types of benefits and duty drawbacks,and process to get those licences. Admin: On 15 September 2014 You can start an export import firm at home, as official address. However business is concerned, it is called office. However you need to obtain all necessary licences depends up on your nature of exports or imports, nature of business firm whether proprietor ship, partnership, pvt ltd etc.etc. Hetal Patel: On 08 October 2014 Dear G. CHINNARAMAN, you can get the IEC code from DGFT (Director General of Foreign Trade), it is so easy to get export license. please go for it..
Subash Chandra Nayak: On 13 October 2014 i want to register a marine product export company. pls advice me what is the process. m.prabhakar: On 19 October 2014 hello sir we are started a pharmaceutical formulation unit in pondicherry.we are having all the fecilities. any one can giving me an idea for export business for tablet and capsules.please giving me an full idea for export and import business. sajimon: On 24 October 2014 dear mr.prabakar, self is working with a Logistic company in Chennai Hope you are having the Drug License in the name of your company. If you have the IEC, Drug License and order in your hand it is very easy to export your product, pls contact any of the International IATA Logistic forwarder, they will help you. SANDEEP JATTAN: On 08 November 2014 Dear sir, i want to start own export import business.How can we search buyers and import company in USA for honey export.Please give me advice and Reply me on my email.Thanks. Nitin patel: On 18 November 2014 That's amazing opportunities in import&export business. CA R.RAJASEKAR: On 21 November 2014 I would like to know about the details/website inforamtion for teh following Iam going to import. To get concession I have to export within such time stipulated. let me know the formalities to be completed for getting the concession of import duty. rajeev: On 22 November 2014 Is commercial area is required for opening a export business. rajesh: On 16 December 2014 i want to know can i export any commodity which is import by me or my firm . raj shekhar: On 03 January 2015 Dear friends i need to import electronic devices into india from other countries so please help me. Diya: On 04 February 2015 Hi Palani K, That was a good suggestions for all exporters. shree niwas singhee: On 09 February 2015 I have inersted import & export business. Pls advise Kolkata to other state kya export kare. I have invest 50 lakh to 1cr. business ka full detail dea. thanks. Jeganathan: On 04 March 2015 how to start export business in INDIA please guie me send me the procrdure to myail! harish khullar: On 17 March 2015 Sir, Please advise me operational Risks in discounting of MT 710 of weak bank in high risk country. Devesh Garg: On 25 March 2015 Hello sir,thnx for sharing such a wonderful information.... But i want to know that how i will search buyers for the export? r.muthu: On 29 March 2015 iam asrtating export& import buissines how go to forther moment.plaes give your same idiyas. R.A.RAJAN: On 04 April 2015 Dear Sir, Many more thanks for sharing such an useful information. I am 52 years aged man, now I am working in Government job, can i able to enter the export business? I am middle class family, so that if possible how to select the name and form a company, if can i enter to best this alone or partnership, I am able to invest one or two lakh initially. I want to guide in which Product and how much workers and building spaces are required for starting the business? now I got pan card only,and i will apply to get IE code No. So now what can i do with necessary essential procedure and humbly request your valuable advice please, thanks a lot. zahid khan : On 15 April 2015 Dear - Sir/Mam I'm a supplier of all type of wooden items in saharanpur India . sir I want to export our wooden items in local India like Delhi , Muradabad etc .But sir I have no buyer from that place .So what can we do from that . sir I don't known much about export business but I known u known very well for our business .So sir pls help us . Emdadul: On 28 April 2015 Dear Sir, i want to start the import & export business from west bengal to tamilnadu please help me for process . like from bengal lots of vegetable we can supply to tamilnadu . how i can start. please help me. CHANDRA MOULY: On 30 April 2015 some suppliers are knocking away the advance amounts for the supplies they promised to send.Police failed to register cases Any alternative is there to get back the money. Dr. Ramchander: On 19 May 2015 I, from hyderabad(India) along with my relative in USA wish to start an expor business. I shall be grateful if you could pl. guide me in detail in this regard. Regards. Mohammad Haseen Saifi: On 19 May 2015 How can i start Export Business in Moradabad (U.P.) India 244001. Arjun singh: On 11 June 2015 Dear sir I want to start a new export of hardware items what can I do for it? Rahul khanna: On 01 July 2015 I want to export something from delhi to usa what do i have to do to setup a import export firm in india ?? mohamed kalim : On 02 July 2015 I got your article on the Internet and I want your help to start Import and Export Business. I am Mohamed Kalim, my qualification is Graduation and Two years Computer Diploma. My home Country is India (Uttar Pradesh) Bhadohi Carpet City (near Varanasi). But I am doing Job in Saudi Arabia (Riyadh) in IT Field since last 6 Years. But I am interested in Import and Export Business, so I want your help, Please help me what is the procedures to open new Company and Registration and Documentation in India. So please help me Step By step all procedures. satish bhati : On 02 July 2015 hi sir, my name is Satish Bhati, I have decided to make my career in Export Business, but due to no guidance I can not start. which course is there for this business. From where to start ...., I want to learn export business. I am interested in learning and doing this business. I hope you guide me about this field. Mustafa Chunawala : On 02 July 2015 MY SELF MUSTAFA. I AM FROM SURAT-GUJARAT. 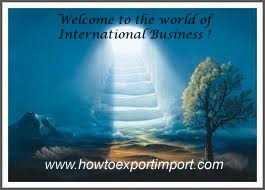 I AM INTRESTED TO DO EXPORT BUSINSS. BUT I DONT HAVE ANY EXPERIENCE, SIR WANT SOME HELP FROM YOU IF YOU DON MIND. nikunj gondaliya : On 02 July 2015 Sir,how learn import & export in small investment & small industrial. Plz.suggeste me..
ravi ranjan : On 02 July 2015 Thank you sir for your valuable knowledge regarding import export. Sir, i just need your help to set my import business in bihar. Sir,can you tell me the steps to set up all. Basically i want to purchase from outside the india and want to sell in bulk to my local maket.so,kindly tell me the stepwise procedure to set up my business. Jahangir Mirza : On 03 July 2015 when i was looking for how to start an import export business & i was highly impressed the way you have presented each and everything in your website. I would like to know that is there any short term courses for import export operated by you? sam Royal: On 03 July 2015 I want to start my own import export business.....but I am not a manufacturer.but in a same way I have a good source of products. So can you plz tell me is this eligible for me do the business. ravi shanker bansal : On 04 July 2015 I wants to start work in this field either as exporter or trader so can you please provide me some websites details like alibaba where I can display or promote the details of my product to find international buyer. jaydip: On 20 July 2015 plz give me full detail of export bussness and how to operate and give detail of how to find buyer and how to give quatation ???? Gaurav Gupta: On 27 July 2015 Hi, I am manufactures of wooden Handicraft items based at Jaipur and want take my business in global market so would you please guide that how can i start such and what is procedure of the same so that i can plan accordingly. vijay: On 10 August 2015 dear sir/mam, i want to start a import/export in india pl tell me what is rules of one state to another state import /export & duties. Ashish Dahekar: On 14 August 2015 i'M warking in electronic at Home Automation sector & I've some interested at clients at foreign country. How can i start export good to foreign ? Archana : On 22 August 2015 hello gaurav please feel free to contact me i help you in this archana22196@gmail.com mail me with your details Gaurav Gupta Says : Monday, July 27, 2015 Hi, I am manufactures of wooden Handicraft items based at Jaipur and want take my business in global market so would you please guide that how can i start such and what is procedure of the same so that i can plan accordingly. sumanth: On 08 September 2015 Friends, Hi ..i am sumanth, from hyderabad recently started my Export firm Garuda Exim(In fact just named/got it registered few days back)with motive to merchandise fruits and vegetables to Asian countries atleast initially. I am seriously looking for good partner who can support me in all possible ways, so guys if interested please contact me at sumanth2020@gmail.com / sumanth@garudaexim.com phone no 9032006300. My website www.garudaexim.com (site is still in developing process just took the space). Robin: On 20 September 2015 can we do exports of machine tool accessories to Iran? If it is possible than which of the national or private Banks are undertaking processing of documents? RAVAL PARTH: On 23 September 2015 I am a student so I want to earn money as a side income...So,How can i start business of import-export without money from Home ? Please state me procedure..
Dashit Raval : On 13 October 2015 i m Student(MBA Persuing) and i want to start my own Import and Export Business, But i have some queries which i mentioned below:- 1.How much investment need for start up this Business. 2.How to do a Product Research. 3.After a Research how do i find a Genuine Buyer. Rajesh Ramamurthy : On 14 October 2015 i saw your web site abt exports and imports, its quit impressive, i would lik to learn more abt it, , i worked for dot com industries, got 10 years sales experience , and i quit my job last month due to not interested to work for others, and i went to export paid class last month which is took by hari dass (chennai), but im not clear abt all i dont feel nothing after coming out from class, dont know how to start n where to start, but i have huge interest in doing self business, i would lik to work for exports to learn practical business knowledge, kindly request you to sugges me. YOVAN: On 22 October 2015 DO WE CAN OPEN CURRENT ACCOUNT FOR EXPORT/IMPORT WITH NON NATIONALIZED BANK ? Arun padiyar: On 23 October 2015 Any body can say how i can find grocery products customer in usa. dkhare: On 24 October 2015 I wanna also start my own business and anybody from anywhere want to be with me then don't be hesitate . I am waiting your call..please start with me I am also want to be a entrepreneur. syed sadiqueuddin: On 07 November 2015 hi sir, my name is syed sadiqueuddin, I have decided to make my career in Export Business, but due to no guidance I can not start. which course is there for this business. From where to start ...., I want to learn export business. I am interested in learning and doing this business. I hope you guide me about this field. syed sadiqueuddin: On 07 November 2015 i want to start my own Import and Export Business, But i have some queries which i mentioned below:- 1.How much investment need for start up this Business. 2.How to do a Product Research. 3.After a Research how do i find a Genuine Buyer. kumar: On 17 November 2015 I have complete knowledge and experience of import/export business. Contact me via email only with specific query, one query per mail only. G.R.Rajanikanth: On 19 December 2015 Dear Sir, I am interested in exporting Agricultural commodities,where i have to get export and import licence,please guide me. Shiva: On 29 January 2016 Hell sir, I am looking for export red sandelwood, how to get licence can u send me my mail . Abhijit Debnath: On 02 February 2016 Dear sir, I want to start Export business on 100% Natural Pith products.Where I have to get export and import licence,please guide me.how to get licence can u send me my mail. Wasim Ahmed Qureshi : On 28 February 2016 I would like to ask about how we can sell the goods and receive the payment and how much the amount to start for the new business and what are the risk factors for that while exporting the jewellery. CHANDRAKANT PATEL: On 01 April 2016 I AM INTERESTED TO APPLY FOR NEW (PROPRIETORSHIP FIRM) IMPORT EXPORT LICENCE. SO I LIKE TO KNOW FEES TO APPLY FOR NEW IEC CODE. Mahammed Rafi : On 18 April 2016 we do commodity business in india.now we want to export our goods to overseas. What do i need to do export business? how can i get export licence? can i export my goods with export license across the globe? our goods are in demand in UAE now.kindly suggest me with your valuable information. govind agarwal: On 18 April 2016 Myself Govind Agarwal , Presently i am doing business of Mobile Phones as a retail shop. from childhood my dream was to do EXPORT-IMPORT business and the effort of DGFT & IIFT i hope and wish mine dreams are going to be true as i have take part in IIFT online certificate Programe name & style Niryat Bandhu. from this course i have learned so much thing which requires for EXIM business. i think to start a new business in EXIM world i have to take some practical experience of this field. help me in this regard. Dream Decor : On 18 April 2016 I am Mohd Salman from Moradabad (UP). i want to start my own export house but don't have idea how to start it. don't know how to find buyer. kindly help me. bijan: On 23 April 2016 hi every body My Name is bijan hajati i live in Iran.i have question I want to start a export business-European Country with low investment can u give me any idea. kindly help me. Suresh: On 20 May 2016 I am interested to start the Import and export business. Is there any one to guide on this. Please contact me. somebody: On 25 May 2016 where are the answers of these questions asked by the viewers? Pramod.N: On 09 August 2016 hi members, please assist me in knowing the details and how to start a import and export firm ,am having a collection of items which are famous for their country which can be imported in our country. azam: On 19 November 2016 i am mohamed azam compeleted engineering .saw your website and it was excellent ..And i am interested in doing imports and exports business and now recently i am working with an exporter for experience.. the hardest part on this business is finding genuine buyer and payment risks i am a fresher in this business ..sir can u please guide me how to find genuine buyers and any ways for finding genuine buyers? it will be very helpful for me sir..
Md Amjad Saif: On 11 February 2017 How can indian product import and export of foreign company...please gice me kind information and traditional enquiries. .8540836506 contact..
Sasidharan S.T : On 10 March 2017 Sir I am sasidharan B.E civil engineer. Now I like to start a business. Please help me. P Bhuvana : On 25 April 2017 I would like to do export business from india to various countries. Please guide me regarding this. Abdul Majeed : On 11 June 2017 it is with great hope, i am sending this mail to get information and service for following notes: - we need to start up a simple firm for export and import business in India based on Chennai - Total expenses which will incur for the completion of legal formalities - detailed information which we can get financial aids from Government side Hope you have understand our requirements and waiting for your advice accordingly. Rajani Jena : On 11 June 2017 Good day to you.I came across your website while surfing the net for some knowledge to start my export import business. I have certain queries before I apply for the IEC from DGFT. 1.) Basically I am an Army officer's wife, I got my pan card issued from Kolkata or Delhi,I don't remember. 2.) My passport and adhaar card have the address of Hyderabad, Telengana. 3.) My bank account is in Dhanbad,Jharkhand. I want to apply online for the IEC ,but submitting these documents will be okay,since I am residing in Jharkhand for the last one year. Secondly, I want to know if I could take the goods from India and sell in Germany. What is the procedure like for this kind of an arrangement. FATUM COMPANY : On 11 June 2017 We are Fatum pvt ltd, a newly registered merchant exporters. 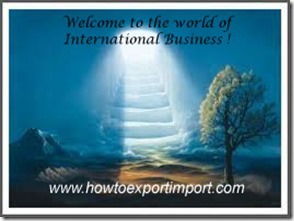 We got your information from "How to Export Import.Com". We have some queries about importing procedures which we want to share with you and would be grateful to you if you could provide us with the right information. We have got one lead from Korea, who deals in cosmetic products like face pack, body lotions, fairness products etc. We want to import their products in India. Their product is new in India and have never been introduced in our market before. We consulted with many regarding the importing process, but were never satisfied with the information. Some told us that we have to register their product while some told that we have to do the valuation of the product. We are very confused about what to do and how pursue in regard to this. Therefore we will be very grateful to you if you can share your thoughts on this. Saranya Karthik : On 11 June 2017 We have some doubt in import and export business. Because we are able to interested an import and export business. Please resolve the below queries, How we can start the import and export? How we choose the product? How to develop the business growth? How we can communicate with clients? Sukhjit Singh Dhaliwal : On 11 June 2017 I am Sukhjit Singh Dhaliwal from Punjab & holding import export license but not able to make any deal through. I want to start import export business for this I need your help. P Bhuvana : On 13 June 2017 I would like to do export business from india to various countries. Please guide me regarding this. Phan Tuyet Ngan: On 14 June 2017 Through of some trade website, I can contact with some clients in India and they want to import fresh meat from Viet Nam. Can you help me about details of document, standards and certificates that we have to prepare for can meet all demands of your country. P Bhuvana : On 15 July 2017 I would like to do Export-Import business from india to various countries. Please guide me regarding this. Sreekanth Nair: On 15 July 2017 Am Sreekanth Nair from Balaji Logistics, Mumbai. We need your suggestions We are interested to start Export business for Agro Products Commodity Now we hv rec'd one confirm order from. Cameron, we hv rec'd the purchase order copy also. Amarendra Kar : On 15 July 2017 Extremely fortunate to go through your blog on “How to export & import “ and have a fair bit of theoretical ideas over the same. But need your personal advice and guidance before venturing out for the same. Kindly help me in this regard to take a decision. I am a novice to the field. At present I am working as a finance manager in Tata Communications. Thinking to leave the job and to start a new business in export and import. 1. It will be a proprietorship firm at present. 2. Initial capital to invest would be around 5 Lakhs 3. Place of business would be at Cuttack, Odisha. 4. Import materials would be – Computer & mobile spare parts , Pulses, some electronics items. 5. Export materials would be – Rice, Moong pulses, Handmade coconut oils, Cow ghees, Mats, handicrafts etc. Can you please help in detailed process and will it be a viable option. Would be very grateful to you for your time. Bharath Bk : On 15 July 2017 This is bharath, I would like to know about how to do import and export business,so please give some valuable information. Amarendra Kar : On 17 July 2017 Extremely fortunate to go through your blog on “How to export & import “ and have a fair bit of theoretical ideas over the same. But need your personal advice and guidance before venturing out for the same. Kindly help me in this regard to take a decision. I am a novice to the field. At present I am working as a finance manager in Tata Communications. Thinking to leave the job and to start a new business in export and import. 1. It will be a proprietorship firm at present. 2. Initial capital to invest would be around 5 Lakhs 3. Place of business would be at Cuttack, Odisha. 4. Import materials would be – Computer & mobile spare parts , Pulses, some electronics items. 5. Export materials would be – Rice, Moong pulses, Handmade coconut oils, Cow ghees, Mats, handicrafts etc. Can you please help in detailed process and will it be a viable option. Would be very grateful to you for your time. mohammad arshad : On 17 July 2017 I’m planning to start my own business in Import and export. I’m excited to get in touch with you and let you know aboutideas in my mind which I would like to share with you as I dont have much knowledge what to import and export. Arbaaz: On 18 September 2017 I intend to start a agriculture export company from india and would request your consultancy services for a price, if you do provide them then contact me. Thirunavukkarasu Ramamoorthy: On 19 September 2017 Hi ! I want to start an export company (production unit) in Tamil nadu. Can you help me by email the procedure and how to get investment by loan . Raj: On 26 November 2017 Dear Sir, I want to start my own pharmaceutical export business, how shall i start with it, what are the procedure to register company and how much expense would be. Please revert on my mail address. Naresh Patel : On 14 March 2018 Hello and Greetings of the day,I hope your are in the best of health.My name is Naresh and i am writing from Gujarat state and city Surat. I am trying to get orders from overseas for finished dosage of pharmaceutical products.But still a have not got any,but may i ask you few question regarding this topic. May i know your fee structure. What are the list of papers the firm or individual or company have if he wants to export. What is the duty the on finished drugs or medicine. What is the correct name to be used to get more benefits from the government. What is the correct name to get less paid to the custom of India ( less custom duty) And many more to know as i come across into this field. Awaiting your reply.I am on what's-up app. MAHESH CHANDER GUPTA : On 14 March 2018 Dear Mr Surendran, Greetings for the day. I publish a magazine for laboratories. It is registered with RNI (registrar general for News papers of India). The magazine is published quarterly and is a periodical. The printer now is asking GST @14% on printing cost. I understand that this category is exempted from GST. Kindly guide me the correct rate applicable. I have no objection to pay GST but it should be as per law-neeither more nor less. sprasadgmail : On 14 March 2018 My name is Sathya Prasad. I and Mr Andrew Coley are the principal partners at Cella Tech, a US based company that has a wholly owned subsidiary, Cella TelEnergy Pvt Ltd in Gurgaon, India. We are looking for ways and means to import telecom related equipment in to India at the lowest possible import duties. We have reviewed your website and found it to be very informative. Hence, we are interested in meeting you at your Bangalore Office and seek your help with our project. We are looking for an hour long complimentary consulting service so that we can interactively discuss our needs and your charges to take the business consulting services forward. Please, let us know if it is possible to meet you on Monday - 5th February in your Bangalore office. : khushpal singh : On 14 March 2018 Khushpal Singh here .got your ref online. I am starting a business of imported greeting cards. Need import advises regarding the same. it will great if you can you please advise us. What is an Export Order? What is FCA terms of delivery? Define the shipping term FOB in detail. Explain the shipping term CPT? Define the shipping term CIP. GST slab rate on sale or purchase of Motor cars and other motor vehicles.